From whole duck foie gras with Armagnac to all natural, pork-free truffle mousse, Fabrique Délices, a traditional French charcuterie company in Hayward, California, has been preparing time-honored classics alongside innovative new products for the past 21 years. With an extensive product line that includes Traditional & Natural Pâtés and Mousses, Seafood and Vegetarian Terrines, Specialty Meats and Sausages, as well as Foie Gras and Duck Confit, Fabrique Délices produces over 2,000 pounds a day. 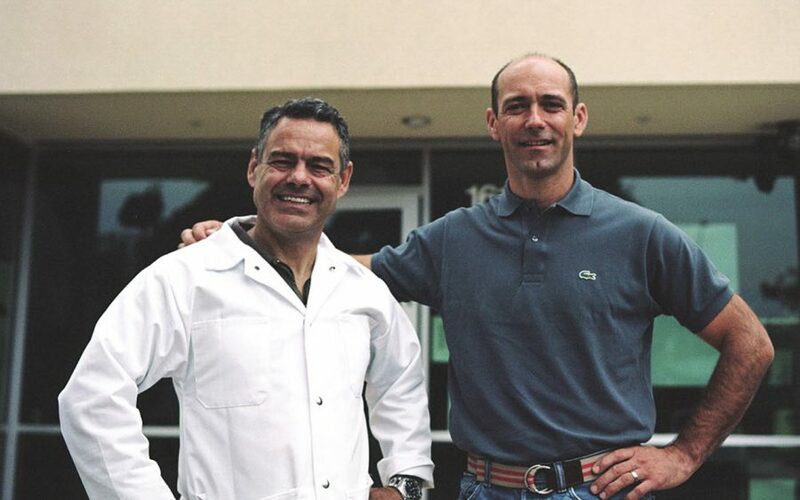 Marc Poinsignon, Co-owner and Président, Antonio Pinheiro, Co-owner, Vice président and chef, came to California 21 years ago when Sapar, the French company they worked for, bought the San Mateo charcuterie plant. Poinsignon and Pinheiro bought out the company in 1996 and retained the name for brand recognition. Fabrique Délices broke ground in 1985 in San Mateo as the United States subsidiary of SAPAR, established since 1920 in Meaux, France. Through the years, SAPAR specialized in what it did best Pâtés, leading to acclaim all over Europe. Today, Fauchon in Paris, as well as the finest Gourmet Stores and Chefs all over Europe, are using SAPAR’s products. When Jean Claude Augé, owner of Sapar France, decided to establish Fabrique Délices in 1985, he was certain to bring a major improvement to the American market. In order to implement these ideas and take control of the U.S. subsidiary, Marc Poinsignon and Antonio Pinheiro were brought from France to respectfully serve as C.E.O. and Plant Manager. In 1996, they purchased the company and 6 years later, moved to Hayward into a newly built 20,000 sqft USDA plant allowing them to more than double their actual production. With over 150 different products among Pâtés, Mousses, Duck Foie Gras, Magret, Duck Confit, Rillettes, Garlic Sausage, Merguez, Saucisse de Toulouse, Boudin Noir, Boudin Blanc and other Specialty Foods, Fabrique Délices offers the best and most versatile line of charcuterie in the United States. Fabrique Délices award winning products are available throughout the United States, Puerto Rico, The Virgin Islands as well as Central America, Indonesia & Asia.